Frank Klausz uses Iiis thumbs and forefingers to direct pressure to the front sole of the *|>okcsliavc on Initli push stroke (right) and pull stroke (left). tangs with cap knobs to lock in the depth setting.) A variation on the traditional wooden shave is the Japanese spokcshavc. which uses a narrow, planelike blade set in tapered grooves as in Japanese planes (see aw «34). Metal and wooden shaves are designed for essentially the same work, but there are some differences between them. One is sole clearance. While the entire sole of a metal shave touches the work, the wooden shave contacts the workpiece at only two points, the front of the sole and the cutting edge. This arrangement makes the shave more susceptible to chatter, but it also offers more clearance for skewed cuts and working tight radii. Another difference between metal and wooden shaves is blade angle. The blade on a metal shave is angled much higher than the blade on a wooden one. (See drawing.) The wooden shave's lower blade angle-makes it better suited to end-grain work but slightly more prone to tearing out on faces and edges. on changing grain. "You can cut diagonally with it and skate across the grain," he says. "With a metal shave, the sole sometimes gets in the way." 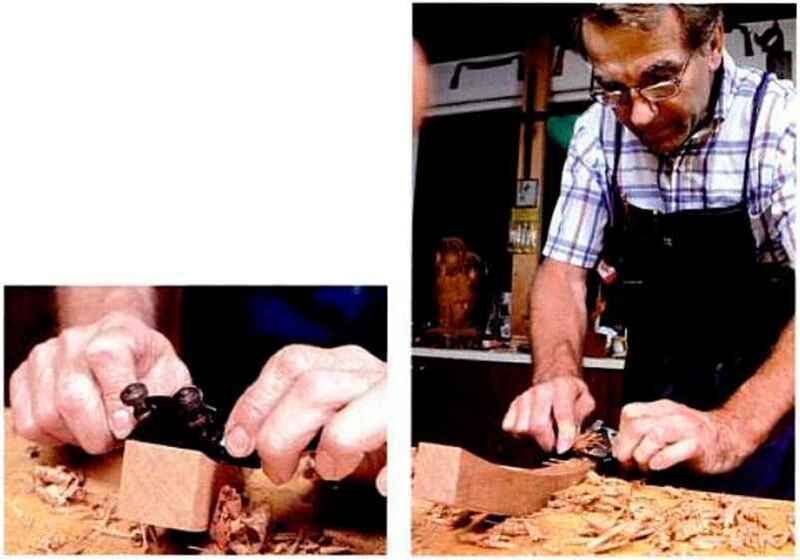 Many special-purpose spokeshaves have been devised over the years (see sidebar, p. 63). and thev remain the best way to accomplish specialized tasks, like chamfering curved edges and smoothing the seats of Windsor chairs. NITCHMMOa ment also changes the configuration of the sole to a slightly concave shape, making it easier to get into tighter inside curves. Whether you purchase a spokeshave new or at a flea market, you don't need a complicated or beautifully crafted tool to do excellent work, as long as the blade, the sole, and the throat are in good condition. Adjustable depth-setting knobs are worth looking for if you plan to do a lot of work with the tool. And regardless of the si/e of shave you're buying, heavier is better. A heftier shave will cut with less chatter. curved- or flat-soled spokcshavc. With its narrower base, a curved-soled shave is better for shaping tight concave curves, while flat-soled shaves work better on convex curves because the wider sole makes greater contact. You'll need to tune your spokeshave for smoothest cutting. On a metal shave, start with the mouth opening, which should be smooth, uniform in width and parallel to the blade. If it isn't, use a fine mill file to adjust it. It's also a good idea to file the bed smooth. (See drawing.) And if there is a cap iron, be sure its edge makes continuous contact with the blade. 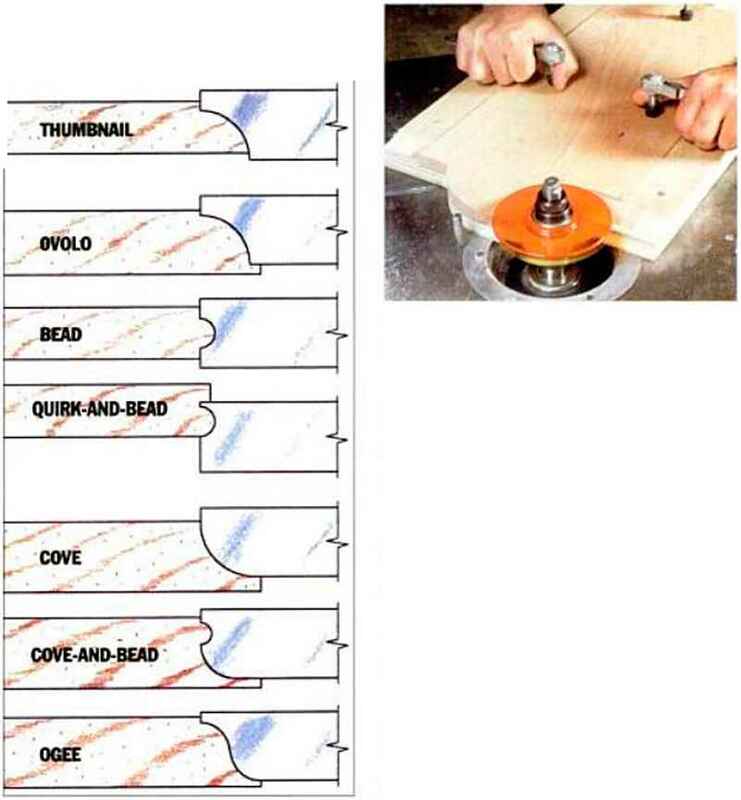 Wooden spokeshaves need less tuning than metal ones. For example, it isn't its critical that the sole be perfectly smooth, since only the front of the sole and the edge of the blade will touch the workpiece. However, it is important that the tangs fit tightly in their holes to resist working loose in use. If the tang holes are too wide, shim them with slips of veneer. Metal spokeshaves: Garrett Wade Co. Inc., 161 Ave. of the Americas, New York, NY 10013, (800) 221-2942. emeu-*,!? Woodcraft Supply Co., 210 Wood County Industrial I'ark, box 1686, Parkersburg, WV 26102-1686, (800) 225-1 153. ilRtlLE *i\Kt remove any grinding marks from the blade's hack and bevel by lapping them on a bench stone or wet-dry sandpaper, then sharpen on a bench stone. When sharpening the bevel on a metal shave, you may find it easier to hold the blade in a kerfed block for a better grip. Give the corners of the blade a few extra swipes to round them slightly so they won't dig into your work. Also, when sharpening the blade of a wooden shave, you must take care to grind the edge of the blade parallel to the edge of the shave's mouth. The correct bevel angle for both metal and wooden shaves is between 23° and 25°. To check this, simply measure the length of the bevel. It should Ix: just slightly more than twice the thickness of the blade.